This past Wednesday, March 19, Detroit Baptist Theological Seminary had its 2008 William R. Rice Lecture Series. This year we were privileged to have Dr. Andrew David Naselli lecture on “Keswick Theology.” Andy is currently pursuing his second PhD at Trinity Evangelical Divinity School in Theological Studies with an emphasis in New Testament Exegesis and Theology. 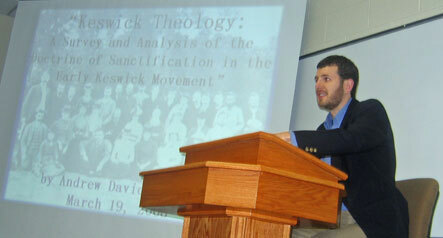 This year’s lecture at DBTS is an outgrowth of his 2006 PhD dissertation from Bob Jones University’s seminary: “Keswick Theology: A Historical and Theological Survey and Analysis of the Doctrine of Sanctification in the Early Keswick Movement, 1875–1920″ (see the 2006 entry on his website’s publication page).The thesis of Andy’s lecture is that Keswick theology’s view of sanctification is theologically erroneous (a thesis that DBTS has been supporting for some time). His lecture has three sections. Part 1 involves a historical and theological survey of the early Keswick Movement from 1875 to 1920 His second and third sessions present a theological analysis of Keswick Theology. His historical research and theological analysis reflect the type of biblical scholarship that serves as a good example to those in attendance at this year’s lecture. To obtain his material, place your cursor on handout and power point presentation. To listen to the three sessions of his lecture, click here, here and here. In addition to the material from Andy’s DBTS lecture, I would also recommend that you regularly consult his excellent blog. Thanks for the link to the lectures on Keswick theology. Certainly this is an important subject. When I came to seminary I was surprised both by how little I knew about Keswick theology and by how much of it was part of my thinking. I am grateful that you, and Drs. Combs and McCune were so persistent to eradicate it from my theology. I downloaded the lectures and just finished listening to them this weekend. I felt as though they were an outstanding presentation and analysis of the history and theology of the movement. Dr. Naselli did a great job of presenting an accurate and fair portrait of the early movement. The more of this that gets exposed for what it is and eradicated from fundamentalism and evangelicalism the better the movements will be. I am glad to see that you were able to listen to the lecture, Ryan. While reflecting a humble spirit, Dr. Naselli reflects serious historical and theological research. In line with your note about your early days at DBTS, it is interesting to note that a number of students come to DBTS with some form Keswick influence. When I initially went to seminary in the early 1970s, I had some strong Keswick influences on my life. Andy’s lecture made me reminisce about the early days of my Christian experience. After the lecture, I looked at my old Thompson Chain Reference Bible and saw that I had inscribed two significant notes in its opening pages: my conversion on March 1, 1969 and my second blessing: “I presented my body once and for all a living sacrifice on May 24, 1974 at 1 AM.” The problem with the second note in my Thompson Chain Reference Bible is that my “surrender” undermines perseverance of the saints. Mortification of the sin nature is a daily fight (Rom 8:12-14). Though I do not know if all DBTS students without exception get over their Keswick journey, it seems like most take serious steps toward eradicating a Keswick influence. While there are many positive aspects to his lecture, I profited from Andy’s lecture in connecting the historical dots.